WHITE: WHEN TO WEAR IT OR PAINT IT. The reason is the same. Recently I attended Houzz University. It was an information session to help Houzz pros improve their Houzz profile online. That evening, while adjusting my profile, I noticed the Advice Tab and ended up spending several hours giving advice to homeowners and answering their questions about colour. It was a huge awakening for me. People, including the some pros, have very limited knowledge of colour and know even less about white. In fact people think white is a default colour. They think white saves them from having to make any colour choices at all. But here is a fact, white comes in many different hues. When a client casually says they just want to paint the walls white …… I think YIKES ……. white is not that simple! White makes a very strong statement and if you pick the wrong white it is hard to live with. Depending on the amount of light in the room, white can make everything in the room appear shadowed and disturbed. Done right, a white room can be calming and an oasis away from the craziness of everyday. You just need to know the right white to choose. My awakening to how complicated white can be, happened many years ago when i was introduced to Farrow and Ball Paint. I had been doing a lot of styling work and often ended up giving colour advice. Now clearly, I did not have the training I have now. I had always been good with colour, but all of my advice was based on instinct. 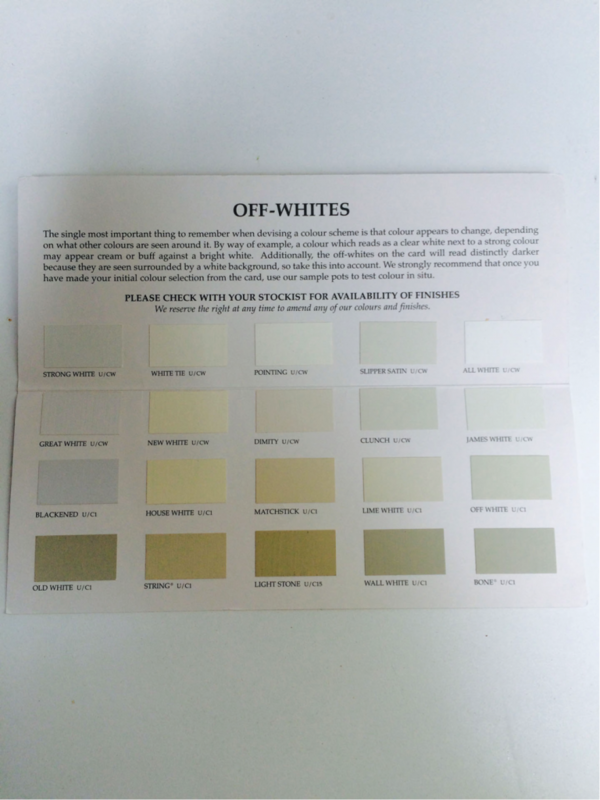 Farrow and Ball had a separate brochure called Off-Whites. When I opened the brochure and looked at the whites I was dumbfounded. Wall White and Old White were clearly labelled as white. I had always thought white was white. In fact I checked the front of the brochure just to make sure I had not misread the title because the whites all looked like colours to me. Why were they calling them whites? I still have that colour card and you can see in the picture below why I was confused. Obviously, my education was lacking. 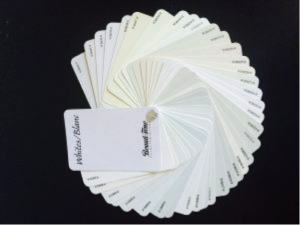 The following week I bought my first fan deck, from Benjamin Moore, and I realized that they too had a selection of whites that didn’t look very …. white! So what the heck was going on????? Well I was soon to discover that white needs to have very pale undertones to make it work in different light situations. 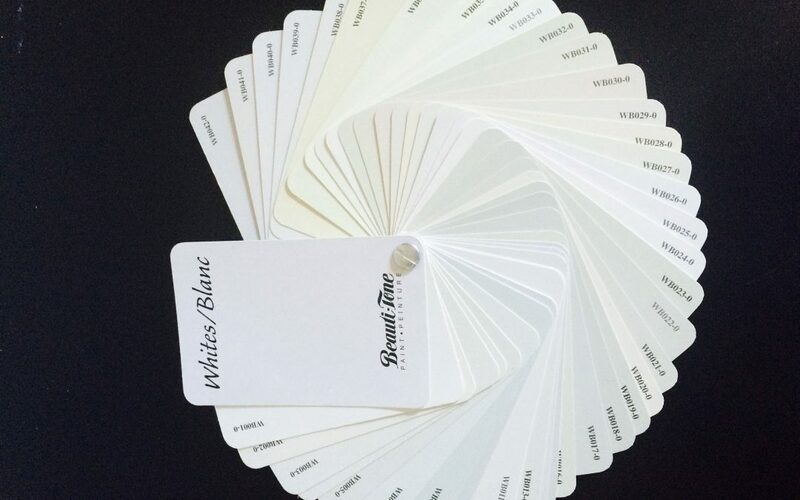 White needs to be very flexible and so a paint company must offer customers a broad choice of whites. White is tricky in the way it plays with light. And if you get the wrong white you get a lot of shadows which just makes your room look many shades of grey. Let me tell you a storey to illustrate, because this rule also applies to humans. Last fall I was in Nordstroms with my daughter. She fell in love with this lovely cashmere sweater and went immediately to try it on. She came out of the dressing room declaring it was be too big. It was black. Being a colour expert I was pretty sure I knew what the problem was. She is tiny and so the black sweater left her looking flat and shapeless. It did appear to be too big. Funnily enough it looks huge on this model too. I found a creamy white one in the same size and when she came out there was a huge smile on her face. This one was perfect. Why, it was the same size! Because the white sweater allowed the contours of her body to cast shadows and it therefore gave the impression of a smaller and more shapely fit. White is like that sweater. It shows everything, particularly shadows. Hence why some of us look better in black or dark colours. Black does not throw shadows and hides those extra curves we would rather ignore. But anyone who wants to look more shapely is better to wear a light colour. So just like beige…… most whites have an undertone. Paint companies also put a bit of black into their whites so they cover better. In other words, so you don’t need 4 or 5 coats to cover anything underneath the paint. 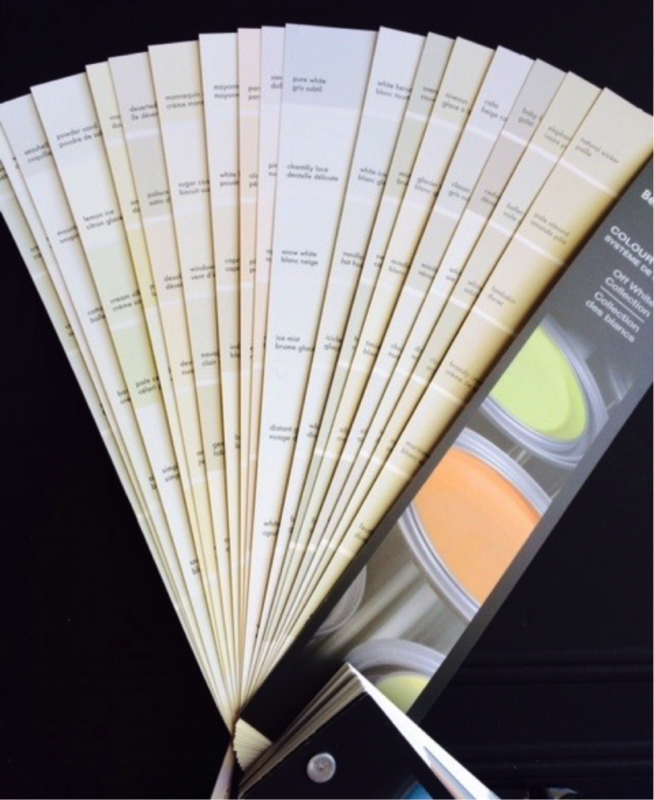 Undertones are added to warm up or cool down the white so you can choose the right one in your room. So it works well on trims, walls or the ceilings and with other colours! A white with a minimally darker undertone can lighten shadows and make the room appear white as a result. White is a trickster! I have written a few blogs on white and the more you read the more you will realize that getting white right can be a lot easier with the help of an expert!